According to the Centers for Disease Control and Prevention (CDC), smoking remains the leading cause of preventable death and disease in the United States, killing more than 480,000 Americans each year. The only proven strategy to protect yourself from harm is to never use tobacco, and if you do smoke or use tobacco products, to quit. Smoking, alone, kills more people each year than alcohol, AIDS, cars crashes, illegal drugs, murders and suicides combined. In the United States, tobacco use is responsible for about one in five deaths annually(i.e., about 443,000 deaths per year, and an estimated 49,000 of these smoking-related deaths are the result of secondhand smoke exposure). One-in-three current adult smokers and one-in-10 former smokers will die premarturely from diseases directly linked to tobacco use. 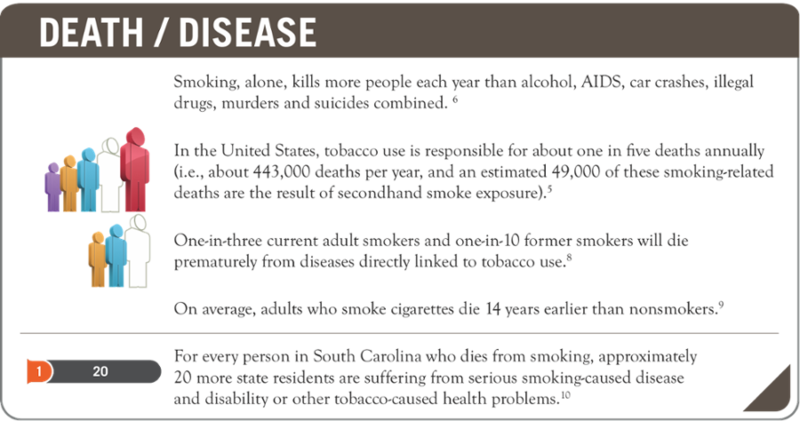 For every person in South Carolina who dies from smoking, approximately 20 more state residents are suffering from serious smoking-caused disease and disability or other tobacco-caused health problems. 5U.S. Department of Health and Human Services (2010). How Tobacco Smoke Causes Disease: The Biology and Behavioral Basis for Smoking-Attributable Disease: A Report of the Surgeon General. Atlanta, Ga., U.S. Department of Health and Human Services, Centers for Disease Control and Prevention, National Center for Chronic Disease Prevention and Health Promotion, Office on Smoking and Health. 8Centers for Disease Control and Prevention. Smoking-Attributable Mortality, Years of Potential Life Lost and Productivity Losses—United States, (2000–2004). Morbidity and Mortality Weekly Report (2008); 57(45):1226–8. 9Centers for Disease Control and Prevention. Annual Smoking-Attributable Mortality, Years of Potential Life Lost and Economic Costs—United States, (1995–1999). Morbidity and Mortality Weekly Report (2002); 51(14):300–3. According to the World Health Organization (WHO), tobacco is packed with harmful and addictive substances. Scientific evidence has shown conclusively that all forms of tobacco cause health problems throughout life, frequently resulting in death or disability. Smokers have markedly increased risks of multiple cancers, particularly lung cancer, and are at far greater risk of heart disease, strokes, emphysema and many other fatal and non-fatal diseases. If they chew tobacco, they risk cancer of the lip, tongue and mouth.2 Click the following links to learn more. What are the benefits of quitting tobacco over time? Savings Calculator: How much money will you save when you quit? There are great campus, state and national resources and support available to help you quit. Different quit options include tobacco cessation counseling, medication and text/phone/Web support. Tobacco cessation programs provide support and encouragement to help tobacco users quit. Nicotine replacement therapies and other tobacco cessation products can help reduce withdrawal symptoms that make it harder to quit. Check out the options available to you below! Counseling and Psychological Services (CAPS), located in Redfern Health Center, offers free and confidential tobacco cessation counseling and is available for students who are dealing with stress and anxiety related to quitting tobacco. Medical providers at Redfern Health Center can write prescriptions for nicotine replacement therapies such as nicotine patches, gum, lozenges, inhalers and nasal spray. Providers can also write prescriptions for Bupropion (Zyban). Students can fill prescriptions in the pharmacy at Redfern Health Center, and the cost of these medications is covered by most insurance plans. Development of a personalized quit plan. DHEC offers free nicotine patches, gum and lozenges to South Carolinians without health insurance. The National Cancer Institute’s Smoking Quitline offers a wide range of services, including individualized counseling, printed information, referrals to other resources and recorded messages. Smoking cessation counselors are available to answer smoking-related questions in English or Spanish. Smoking cessation counselors are also available through LiveHelp, an online instant messaging service. LiveHelp is available Monday through Friday, 8 a.m. to 11 p.m.
SmokefreeTXT is a mobile text messaging service designed for adults and young adults across the United States who are trying to quit smoking. The program was created to provide 24/7 encouragement, advice, and tips to help smokers quit smoking and stay quit. It is a six to eight week program, depending on when you set your quit date. Users will receive one to five messages per day and can receive additional quit support by texting one of SmokefreeTXT's keywords. Freedom From Smoking® Online is a program specifically designed for adults who want to quit smoking. It’s an adaptation of the American Lung Association’s gold standard group clinic that has helped thousands of smokers to quit for good. The National Cancer Institute’s Smokefree.gov offers science-driven tools, information and support that has helped smokers quit. You will find state and national resources, free materials and quitting advice from the National Cancer Institute.